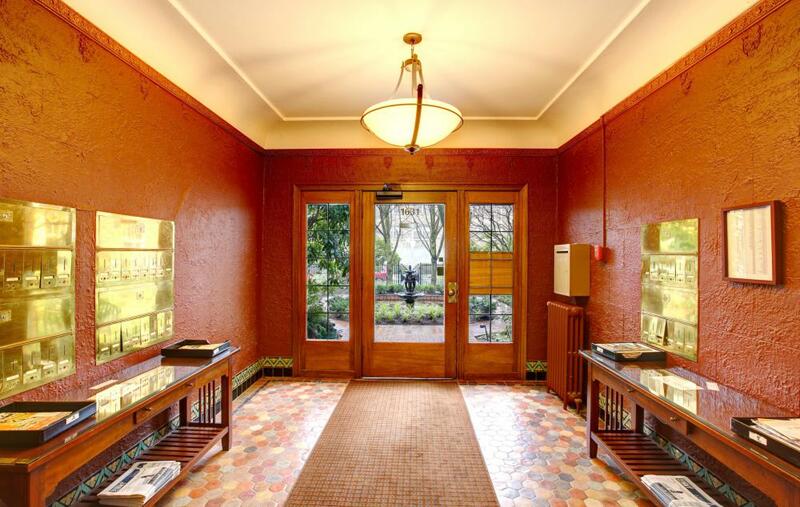 What Are the Different Types of Entryway Designs? Golden paint and crown molding give the appearance of a bright entryway. Grand foyers may be spacious and have seating, tables, plant stands or more pieces. The different types of entryway designs may be categorized into those that feature seating and ones that don't. Smaller entryways don't typically have room for much furniture other than a small hall table, while grander foyers may be spacious and have seating, tables, plant stands or more pieces. No matter their size, some designs for entryways feature artwork, while others are more utilitarian and have just practical additions such as a mat and umbrella stand. The colors and decor styles of entryway designs also differ widely, as they tend to be kept similar to the rest of the home. For instance, in a rustic, country-style house, the entryway is likely to be quite detailed and colorful in its design. Even if it's small without much room for furniture for the entryway, there may be many little, rustic touches such as a wooden bench and an antique milk can to hold umbrellas. The walls and windows aren't typically left bare in country entryway designs. Plaques or pictures displaying country motifs such as farm animals or uplifting sayings may decorate the foyer walls. Windows in this kind of entry may feature checked or patterned curtains in a cheerful color. In a more modern entryway, even a larger one, the design may be purposefully minimalistic. 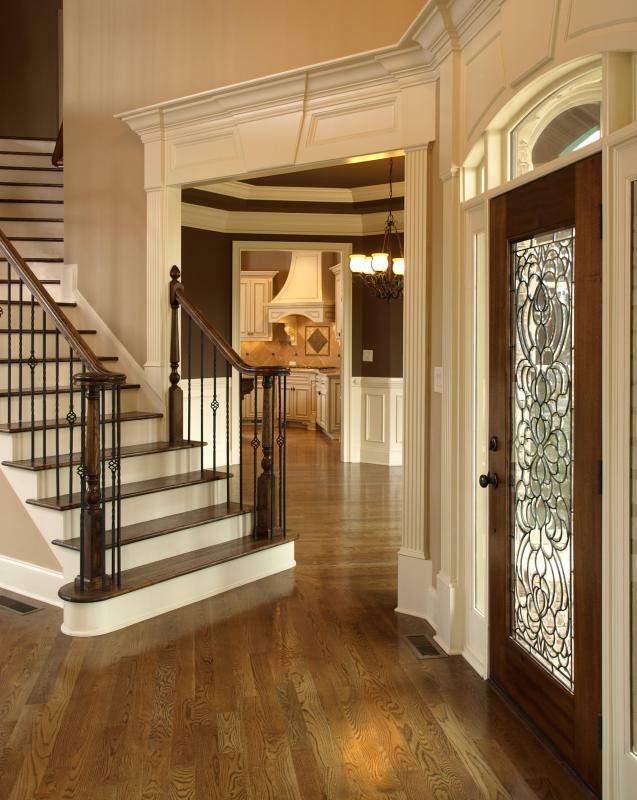 The color scheme of modern or contemporary entryway designs may be neutrals only or feature one bright accent shade. Typically, modern styled entries have a few larger furniture pieces rather than many small items. Some contemporary homes may contain no furniture, but instead focus the eye on a large piece of artwork. Traditional homes may feature an entryway with a classic hall table and mirror set. There may be framed pictures on the walls as well as accents such as a vase of flowers and a lamp on the table. Entryway designs in family homes may be styled mainly for organizational purposes. For instance, if the space is large enough and there is no hall closet, a large wardrobe may house the family's outerwear as well as contain compartments for backpacks, briefcases and sports equipment. If a home features a striking architectural feature at the entryway, such as a grand, sweeping staircase, the area by the front door may be purposely left bare. In this way, the dramatic focal point is showcased rather than a distraction from it being created by having furniture in the entryway. In some entryway designs that call attention to an interior feature, just a few items such as a doormat and two small tables under identical windows on either side of the door may be added. How Do I Choose the Best Entryway Tables? What Are the Different Types of Foyer Benches? What Are the Different Types of Entryway Furniture? What Are the Different Types of Foyer Tables? What Are the Best Tips for Decorating a Foyer? What Are the Different Types of Entryway Storage Benches? What are the Different Styles of Wrought Iron Design? @raynbow- Ferns are great plants for an area like your entryway. They don't need a lot of light or water, so they are low-maintenance. They also look great. @raynbow- You should think about putting an artificial plant in your entryway. You don't have to worry about it not getting enough sun or needing water. Today's artificial plants are not like those of the past, either. Many of them look so realistic that it is difficult to tell that they aren't the real thing. I have an entryway that doesn't get a lot of sun, but I would still like to put some kind of plant in it. What are the best types of plants for a dimly-lit area like this?